Through My Eyes: SHILLS Purifying Peel-Off Mask. So, recently when I was social-mediaing on Facebook, I kept seeing videos of different girls with black mask on their face everytime I scroll down. Talk about effective video advertisement because I actually clicked on the video after many times seeing the shadow of it. I got very curious and so I went on and purchased it. Yep. When I clicked on the video, it auto-route me to a page called Nova Stuff and from there, more videos of this peel-off black mask. The funny thing was when I was in the page, this is how the product looked like. I didn't pay attention to it before but I did after I received the product few weeks later. There were few differences to what I saw online. Photo above is from the internet and below is from yours truly. Nova Stuff's website shows no brand whatsoever on the peel-off mask product. The one that came in was from SHILLS. They black-out the brand probably because they don't want people to go other websites to compare prices or in my case, if I knew that it was SHILLS, I would have gone to Lazada via ShopBack and get more discounts. They even changed the small caption color below the word Black Mask. 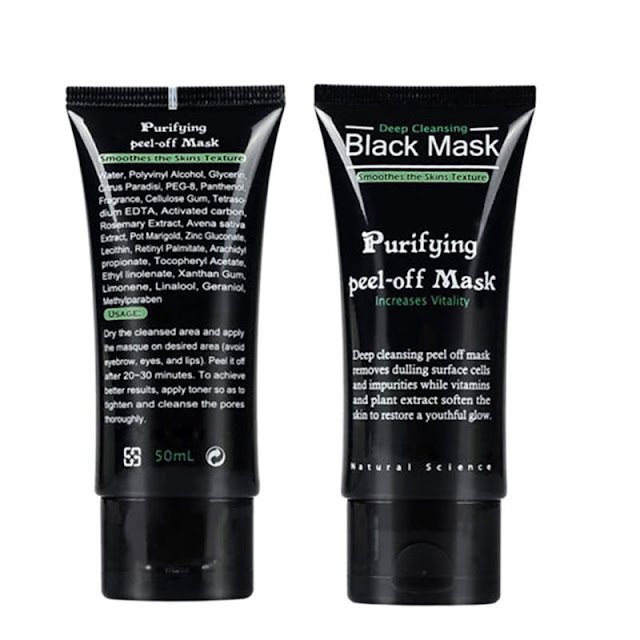 I paid a total of RM90.13 for this tube of black mask that I believe works way better than all the other blackhead-removals that we've tried over the years. Heh. In a way, I felt that Nova Stuff is like trying to 'con' people to buy things in their website, letting users think that this is one of their product and you can only get them at their website. Or maybe I was the only one who thought of it like that. Then again, why do you need to hide SHILLS on the tube? Never again on Nova Stuff. When it arrived, I got my sisters and mom to try it too. Good things must share right? I really wanted this to work because I just cannot find others and waste more money. I felt that this was very expensive at first but all the videos and reviews made it so convincing and easy for me to click 'Confirm Purchase'. It actually pulled out most (if not all) of the blackheads and whiteheads. I was amazed to be honest. I didn't think I would see so clearly all the heads on that black mask! So geli but satisfying at the same time! Thank you SHILLS. Now I have a favorite blackhead-removal mask - SHILLS Purifying Peel-Off Mask! Can you just look at the photo above? Can you see all that tiny poles-lookalike!? It really works. Worth the RM90.13 okay. Not wasting money because it really works! It's also very easy to apply. To make it more effective, you can wash your face and then take a warm towel and wipe around the area that you want to apply this SHILLS Purifying Peel-Off Mask so that the pores will slightly be opened. Then, just apply on the desired area and wait for it to dry. Don't put too little though because it's very hard to see it and also maybe it won't be able to stick onto the heads. Yeah. Just be fairly generous with the gel. I love this product and highly recommend it!